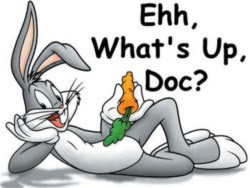 Joe Blogs: What's up Doc?! Had a day off work today as had to take a journey over to the hospital due to my Girl's tooth problem. We were going there thinking that there would be some serious drilling out and sledge hammers thrown. In fact it wasn't even close to that as we were told to return another day. Funny thing was walking through the hospital it was empty until we came to our ward. It was heaving there and no where near enough sitting area. Is there some kind of tooth epidemic taking place?!? Luckily we were only there an hour and left to the tune of my Girl needing not one but two teeth removed! She now has to wait for the letter telling her the dreaded date and then have to spend the day there! Eeek!